Not every bar is for everybody. But you have to respect a bar if it has a dedicated crowd that appreciates what it does. That’s the case of DC’s Tavern. 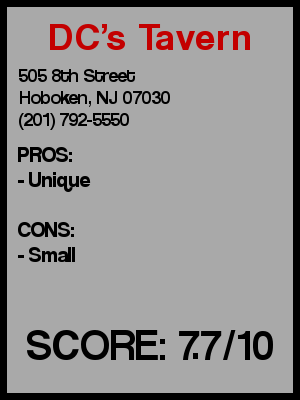 Tucked away on the western part of Hoboken on 8th Street between Jefferson and Madison this gem of a punk/dive bar is not for everyone, but it certainly knows how to stay true to its crowd. 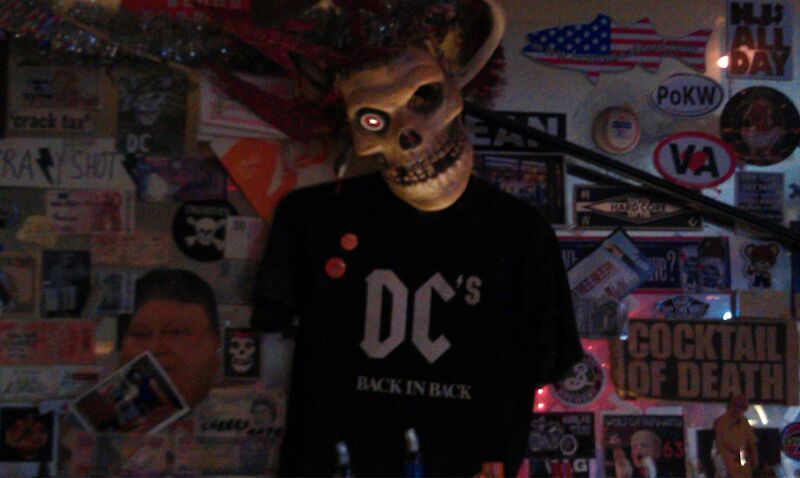 I stopped by DC’s Tavern for an early afternoon drink or two while waiting for a sandwich from Backyard Bistro, which is next door. There’s great synergy between the two places as Backyard Bistro is a BYOB place and DC’s does not having a kitchen of their own. So I put in an order for one of Backyard’s delicious pretzel bread sandwiches and went next door with a friend of mine and we instantly doubled the crowd early on the Saturday afternoon. The bartender was nursing a bit of a hangover himself and had also put in an order from Backward as well. 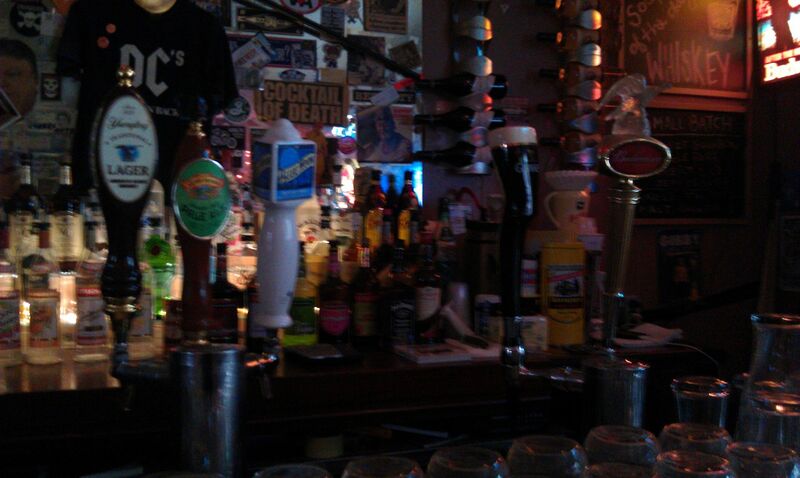 He served us both our beers, I went with the Yuengling and my friend went with the Allagash White. While my friend and I caught up on each other’s lives the bartender and one of his friends were fixated on Smokey and the Bandit on one of the TVs. Being from Virginia the bartender said that it was basically required viewing for all of the state’s youth. Having never really watched it in its entirety, it was definitely was enjoyable and added to the flavor of the bar. 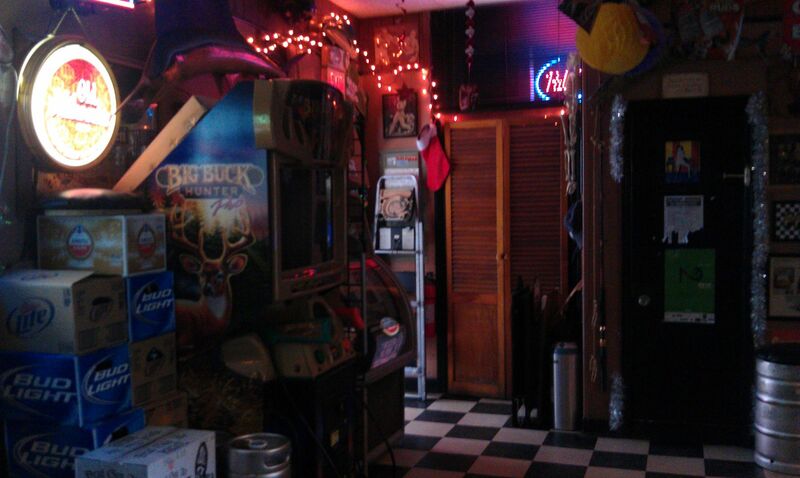 The place is tiny, with 6 or 7 barstools, a pool table right in middle of the place, and a Big Buck Hunter machine and a jukebox next to one of the doors. The buck hunter and jukebox were both unplugged (and really there was no reason to use either for there were just 4 of us in the place) but I heard the jukebox has a great selection. 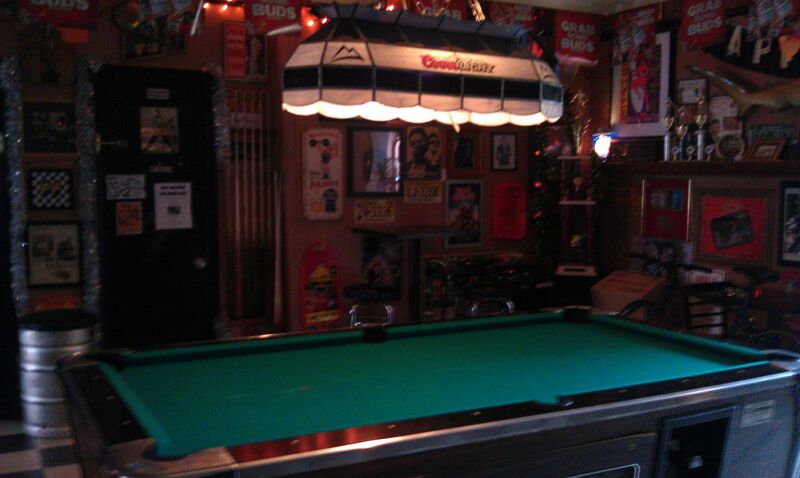 The place is definitely decorated as an authentic dive bar… on the wall there are Schlitz, Milwaukee’s Best, High Life, Busch, PBR signs and memorabilia…basically the holy quintuplet of crappy college beer that I used to drink (well not so much the Schlitz). All of the stuff was aged pretty well so its not like they just bought some of the pieces of wall flair. Also on the wall are your standard dive items like small concert posters, bumper stickers, original art on 8.5 x 11 paper…and some non-standard items like a animal skull and a face of a skeleton. I assume they serve most of those drinks but I stuck with the Yuengling for my second beer and my friend grabbed a Sierra Nevada Pale Ale (much to the confusion of the bartender who must not be used to people ordered drinks so classy). A couple more patrons showed up and they also had tattoos like the other guys that were already there making me and my friend look a little out of place, but in general everyone in the bar was very friendly. After our second beer the movie was winding down, and we also had just finished our sandwiches, so we decided to move on. Preconceived notion – I’ve never been there before, it seemed like a neighborhood bar to me since its pretty far off the beaten path. Based on my “research” it also seemed like a mix between a biker/punk bar. Like a small scale CBGB minus the musical guests. Crowd stereotype – There were basically 4 of us. Seems to me that its an anti-yuppie crowd…and feel free to show off your tats. Music – There was no music on so we could hear Smokey and the Bandit, but they apparently have a good jukebox. Value – Pretty cheap beers, especially if you stick to the PBRs of the world. Date – Not really, but depends on the person. Hookup – Maybe, but then again there were only dudes there when I was there. Dance – Might get beaten with a pool cue. First or last drink of the night – Great. Overall - Now I am probably not DC’s Tavern’s ideal crowd, and I probably wouldn’t take my girl there, but honestly it was a fun time, and I think that I’d have no problem going back. In a place like Hoboken there are too many either upscale club bars, or Sports Bars with the hundreds of TVs for the general generic masses. 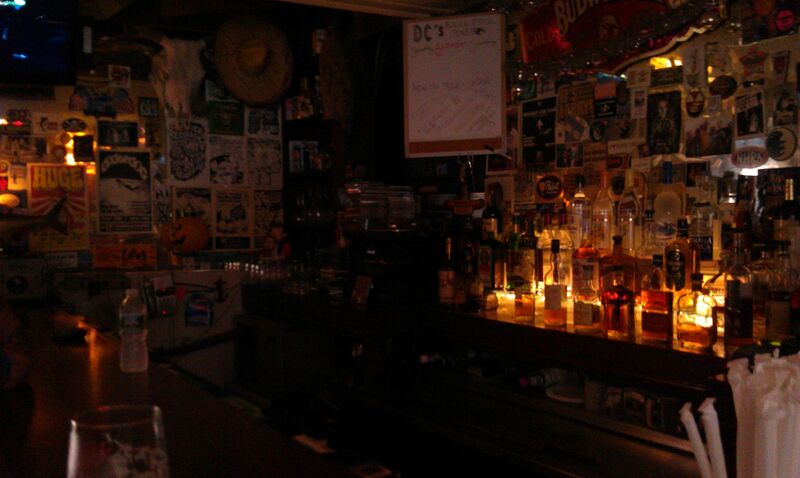 Places like DC’s have actual authentic flavor and a break from the ordinary. 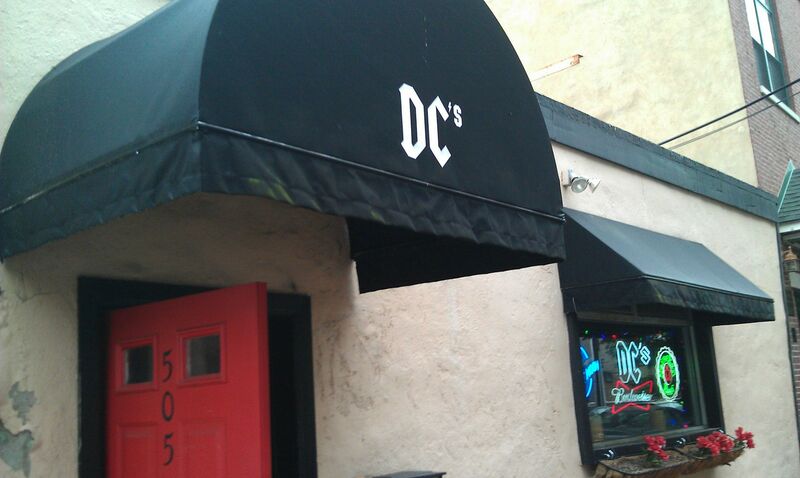 DC’s is one of a kind and honestly I hope it kinda flies under the radar so that it doesn’t lose its character but still has enough business to stay in business. I’ll give it an 7.7.